The phrase “Con Amore, Per Favore” is the motto of Wink 24, it means “with love, please”. That is precisely what owner Fernanda Borletti brings to Wink 24. It is apparent in every detail of this new Biltmore restaurant. It shows in the design of the restaurant, the fortune teller style kids menus, and even the paper wrappings (they feature cute little expressions of love in Italian). We recently were invited to share in the love and dine at Wink 24. Before we get to the delicious food, lets take a minute and talk about the owner Fernanda Borletti. The minute you meet her, its like being greeted by an old friend. She is so warm and welcoming, its as if she is welcoming you into her home, not her restaurant. We talked to her a bit about Wink 24 and she explained that she felt that she had a unique opportunity with Wink 24 and that it is an honor to be serving the community and touching humanity. Wink 24’s menu is primarily Italian (based on Fernanda’s husband’s roots) with a bit of Latin flair thrown in (Fernanda’s roots). The appetizers showcase this fusion beautifully. 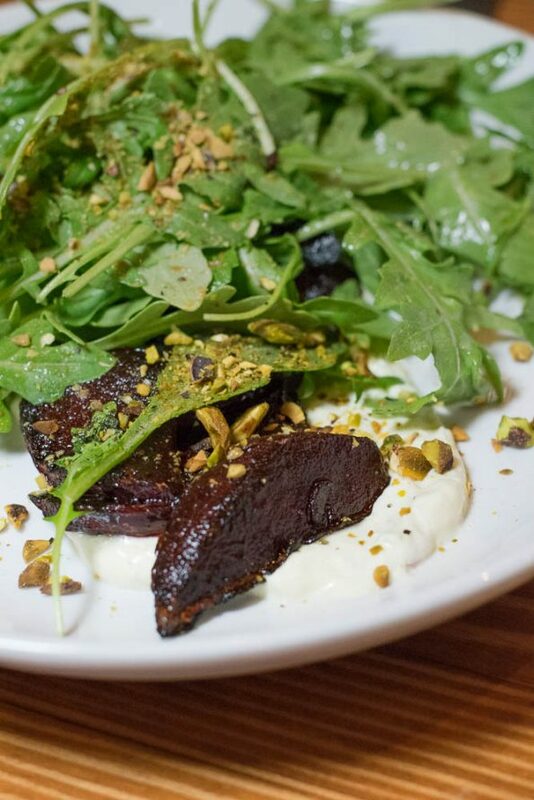 One of Fernanda’s favorites, the Roasted Barbabietole (fire-roasted beets served over a bed of arugula and spicy yogurt sauce) is a great example. The house made yogurt sauce has finely diced serrano peppers added in giving the earthy beets some much needed acidity. Normally we aren’t fans of beets but we went back for seconds and thirds on this one! We also tried the Polpette (Italian style meatballs made with Niman Ranch beef and pork, served with a spicy tomato sauce and bread) and the Zucchine Fritte (Paper thin slices of flash fried zucchini served with labneh yogurt dipping sauce). You haven’t lived until you’ve tried the Zucchine Fritte, it is perfectly fried and crispy. The meatballs incredible, the combination of pork and beef made them tender, juicy and full of flavor! Next we tried two of the salads offered at Wink 24, the Greca Salad and the Roasted Parsnip and Pecorino Salad. The Greca Salad is a “classic Greek salad made with campari tomatoes, hot house cucumbers, red peppers, sliced red onions & chunks of imported Greek feta, dressed with red wine vinegar & extra virgin olive oil.” The amount of cheese alone on this salad made it outstanding. All joking aside, the carefully selected tomatoes were sweet with just the right amount of acidity. Additionally, the other components combined created a really flavorful Greek salad. The second salad we sampled was the Roasted Parsnip and Pecorino Salad. 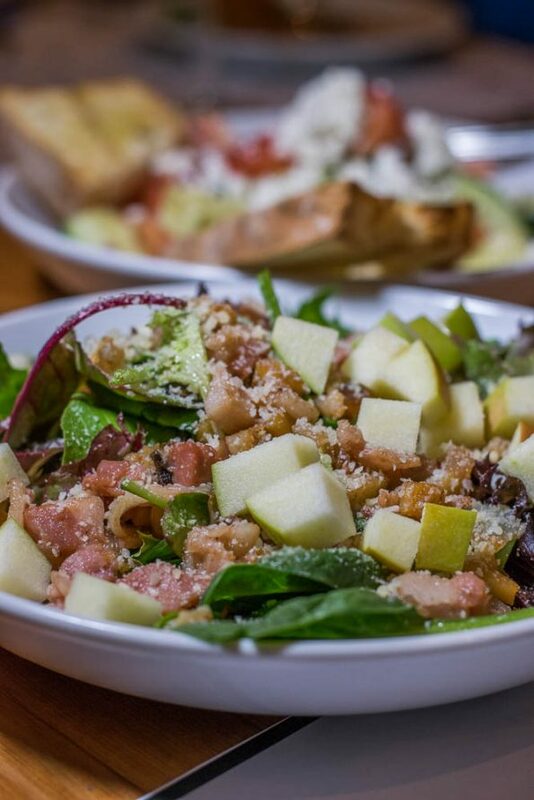 With roasted parsnips, crisp bacon, green apples & shaved Pecorino, tossed in Vidalia onion warm vinaigrette & served over a bed of greens, we literally could eat this salad every day. Every single thing about this salad just screams perfection (that dressing…)! Following the salads, were some of Wink 24’s wood fired pizzas. We tried the Prosciutto (prosciutto crudo, arugula, mozzarella, Parmigiano Reggiano & tomato sauce), The Diavola (tomato sauce, onions, sopressata, roasted bell peppers & oregano, and The Formaggi (Ricotta, Fontina, Parmigiano Reggiano & Mozzarella, drizzled with truffle oil & topped with caramelized red onions). Each pizza was epic in its own right! At the suggestion of Fernanda we added the chile morita (a smoky and semi-spicy chile oil) to each pizza. Our overall favorite of the 3 was the Prosciutto. 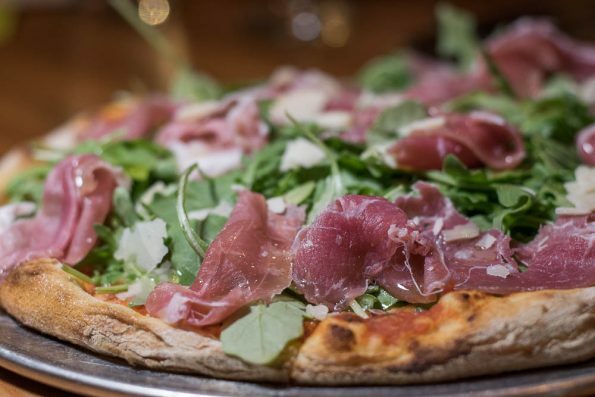 Arugula is one of our favorite our favorite pizza toppings so we may be slightly biased. However, the unsung hero of the 3 pizzas was their crust. Crispy with just enough give and well salted, it is exactly how a pizza crust should be served. As if all of that wasn’t enough, we had to try some of their desserts. We tried the Classic Tiramisu and Not My Birthday Cake. The tiramisu was true to form tiramisu. It was moist, delicious and delightful! The Not My Birthday Cake was an unexpected highlight! 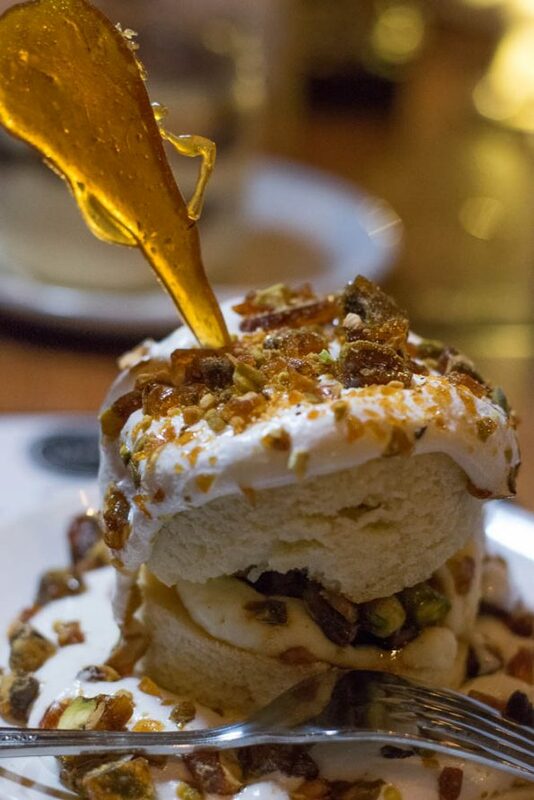 It is made with vanilla cake, pistachio brittle, and Swiss meringue. The cake was slightly dense but in a good way and the combo of the rich meringue and pistachio brittle was out of this world! There is so much great looking food on Wink 24’s menu that we are going to have to make a 2nd trip. Maybe a 3rd. Even a 4th. Each visit will surely feel like returning home for a little love. 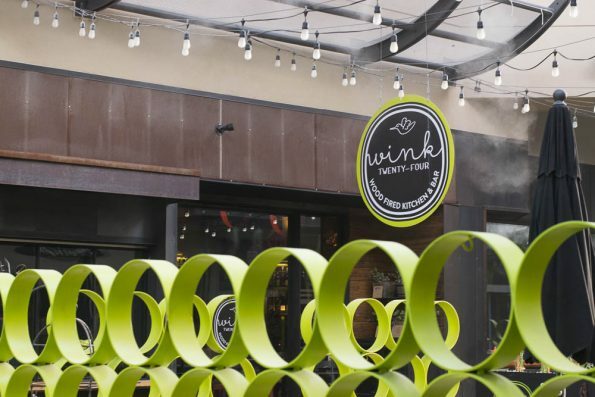 Have you been to Wink 24? What were your favorite menu items? We’d love to know! Leave a comment below or use the hash tag #GeekEats! Wink 24 is located at 2502 East Camelback Road Suites, 148 A and B. The article above is so flattering to both the owners and the food. However, I gotta say that both the food and The owners will impress you even more than this glowing review. Finally, we food lovers can add another class act to the Phoenix culinary options!